We are able to locate damage to underground electrical services, pinpoint the exact location of the problem and complete required repairs. We will locate faults with cables that are directly buried into the soil. Our equipment helps saves the customer expenses by determining the location of the problem and repairing the fault, instead of replacing the entire underground service. At Genesis 1:3 we use the latest technology widely seen as the industry standard. No Power? No Electricity? Just discovered you have a bad underground power line? Our electrical fault technicians will locate electrical underground faults and the issues that come along with them. Once we have located and determined the fault we will fix the problem. Let our electricians help get your power back on! A ground fault is when the electric charge from a system goes into the ground rather than flowing through your system. 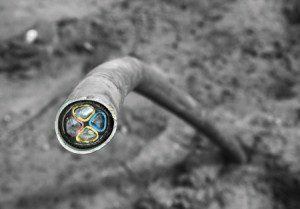 If you have buried cable in your electric system, there’s always a chance of a ground fault occurring. But what do you do if you have a cable that fails? Please call the experts at Genesis 1:3 Electric. At Genesis 1:3 Electric, we can save you time and money by pinpointing exactly where your wire has failed. Our highly-trained technicians use fault finders to locate the area that needs repairs. If you have any questions about fault locating services, please contact us. We are happy to explain our services.